Ascending Butterfly: Win a Fathers Day Grand Meat and Cheese Basket from 1800baskets.com! Win a Fathers Day Grand Meat and Cheese Basket from 1800baskets.com! This giveaway is now CLOSED. Thanks so much to our wonderful sponsor 1800baskets.com! We look forward to working with you again! The winner is 'saphyress'. Remember: There are great giveaways active on the upper right hand side of the page! Happy Father' Day! 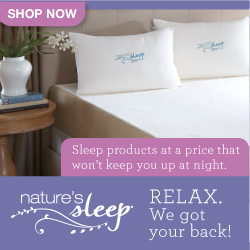 OK, so right now it's a little bit early, but not to early to start thinking of gifts! Most people I know say that shopping for Dad is the hardest. While most I know say their moms just don't want them to spend too much, their dads say 'I don't need anything'. Well most of us don't technically 'NEED' anything, but we want everything, am I right? Don't let dad off the hook that easy, while his lips may grumble 'I don't need anything', trust me folks, there is a little boy in there who WANTS stuff. Cool Stuff. Unique Stuff. Ladies, trust me when I say the one thing that will never change is that the way to a Man's Heart is through his stomach. His food loving, amazingly quick calorie burning stomach. Feed him and he's YOURS! I have been giving and receiving baskets as gifts for YEARS now, and I will say that the best presenation by far has been with 800 Baskets. You receive it exactly as pictured, and they are always so much fun to open. There is attention to detail from the contents, to how it's packaged and wrapped, and even with the shipping, the attention to detail is there. Instead of a box that lets out packing peanuts all over the carpet, the peanuts themselves were contained in their own packaging so the basket was protected from being bumped in transit, but was also easy open with no mess. On Mother's Day 2010, Ascending Butterfly readers showed 800baskets.com so much love on their facebook page and on Twitter, that they have come back to join us for the kick off of our Father's Day Buying Guide! Great job guys and girls! There is quite an extensive assortment of baskets to cover all kinds of dads. Let's not forget the other guys in our lives who are dads, our brothers, uncles, grand-dad, boss, your postal carrier, doorman, that favorite co-worker you go to lunch with everyday, etc. While there are many more, I'm going to highlight the ones I received, in the order they were received. 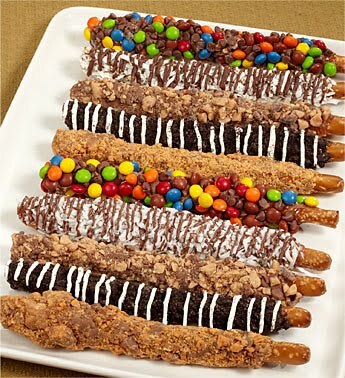 I'm going to start with the Crunchy Candy Crush Pretzels, and it's because I'm eating one right now!!! 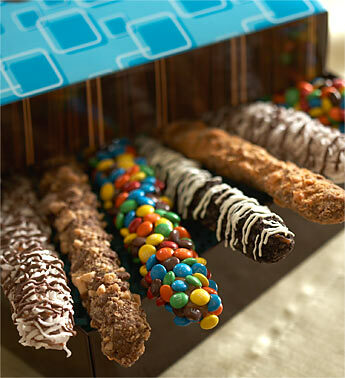 Basket 1: What do you get when you take the crispiest pretzel rod you’ll ever crunch, dip it in caramel, then cover it with one of 5 classic candy favorites? An unbelievably excellent treat that’s only for the sweetest of the very sweet. They’ll love munching on this satisfying snack. It’s easy to share – if they dare. This was one of the ones that arrived during memorial day weekend, I'm amazed that I even was able to save one for me, these went super quick. I loved the box and that each one was individually wrapped. It's the best of both worlds, a crunchy pretzel dipped in a sinfully delicious candy topping! Sweet & Salty! They are perfect if you are planning on making Father's Day a Movie Night. (At home or at the theater, these are way yummier than stale popcorn, I'm just saying!) These definitely received a thumbs up! Adding this one on to my corporate quick gift list as well. Basket 2: This one also arrived during Memorial Day weekend, and the contents were prepared and quickly devoured. A thumbs up from the entire 'casa de butterfly' breakfast table for the 'Hearty Breakfast Gift Basket'. I can't imagine any dad not loving this one, especially presented to him by you and the kids, who can resist breakfast in bed? 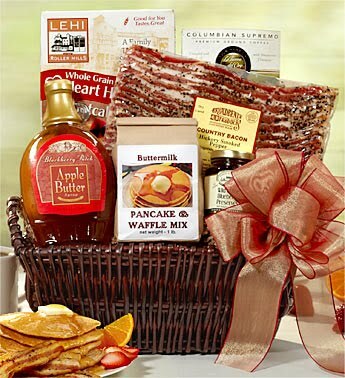 Inspired by the hearty breakfast fare served in rustic mountain cabins, this unbelievably decadent basketful of breakfast foods has been designed with Dad in mind. This Father’s Day, make Dad breakfast in bed. 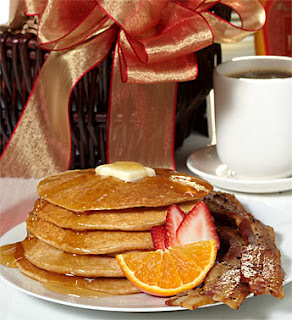 Start with a steaming hot cup of Columbian coffee, Lehi Roller Mills® Whole Grain Heart Healthy Hotcakes, or buttermilk pancakes and waffles with apple butter syrup and topped with rich, sweet wild Maine blueberry preserves. Next, serve up a side of crisp hickory smoked pepper bacon. Top if all off with a huge hug and a kiss to make Dad’s special breakfast complete. All I can say is that there is a reason why Breakfast is considered the most important meal of the day! I don't know what arrangement 800baskets.com has with Fedex but this arrived early in the am and everyone was hungry! While more hands meant this basket disappeared quickly, it was fun having help in the kitchen! I know sometimes people hesitate buying baskets because they figure they won't like all the contents, but I am sure that this basket of breakfast goodies will be the perfect way to start dad's day! I do have a few Golf Loving Dads in my life, thankfully none of them were here when the Golfer's Choice Big Ceramic Snack Bowl arrived, because that would have started a war for sure! It’s a great big hole in one! 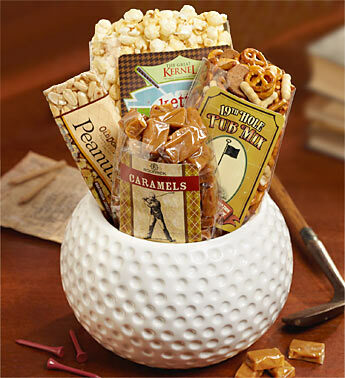 Speak Dad’s snack language with this super cool, super big, ceramic Golfer’s Choice Snack Bowl. It’s packed with treats including Kettle corn, pub mix, an Old Dominion® peanut bar, and praline pecan caramels. Makes a great Father’s Day gift that’s right on par! 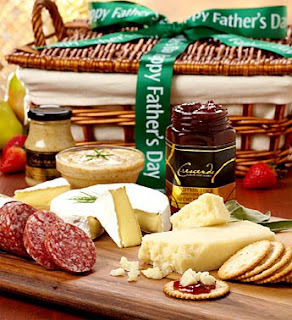 Fathers Day Grand Meat and Cheese Basket - This Father’s Day, make a grand gesture in gourmet food gift giving. He’ll love San Francisco-crafted Columbus® classic Italian salame that is hand-tied, and American-made farm fresh premium cheeses like Rouge et Noir® Original Brie Cheese and Sierra Nevada Aged Goat Cheddar Cheese. Pair these exceptional cheeses with snacks like a citrus spice appetizer spread, sweet & spicy mustard dip and premium water crackers and it’s enough to make a foodie weep tears of joy. This basket is perfect for a picnic in the park or at the beach!! You and your honey should definitely take some time to re-connect, how about after the kids are all tucked in their beds, you grab this basket and your sweetie and watch the sunset together? Ƹ̵̡Ӝ̵̨̄Ʒ - WIN IT! 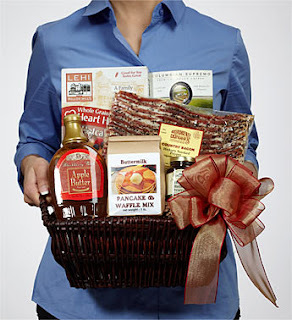 - Ascending Butterfly and our friends at 1800baskets.com would like to provide one lucky winner with the opportunity to win the Fathers Day Grand Meat and Cheese Basket! (ARV $69.99)! Don't you just ♥ 1800baskets.com? I know I do! And I know Dad will too! Ƹ̵̡Ӝ̵̨̄Ʒ - How to Win: (1) You must be a PUBLIC follower of Ascending Butterfly to be eligible for this and all giveaways. Indicate in your entry that you follow (if your 'comment name/user id' differs from your profile id, please let me know what name you follow under) and (2) Visit 1800baskets.com and pick another FATHER'S DAY basket OTHER than the review & giveaway baskets featured here and post the URL (3) You must also leave your email address somewhere in your comment. (You can format it this way for security, example: ascendingbutterfly AT mail host DOT com, If your email is visible in your profile, just say so, that's OK! Just remember, even if you are a subscriber, if your profile is set to private and you don't include an email we have to disqaulify your entry). Please follow the easy 1, 2, 3 steps to winning! This giveaway is open to USA residents who are 18 years of age or older. Ƹ̵̡Ӝ̵̨̄Ʒ - Purchase any basket anytime between 6/2 - 6/14 and receive 10 extra entries. (you will need to email us a copy of your invoice as proof. Yes, you can cross off method of payment information! We are excited to report that this giveaway is a Prizey.net's Editor's Pick! Thanks Prizey, and thanks for all the Ascending Butterfly readers for your enthusiastic response! I Follow/Like Ascending Butterfly on Facebook! I follow you via google friend connnect. My dad lives in Florida and would love the Father's Day Fresh From The Orchard Fruit Basket. I follow Tracy Iglesias in Twitter. I posted your button on my blog right side 35th down after baby counter. I follow you thru google. I follow you publicly! Woo hoo! And my email is on my profile. I'm a follower. You just made my day. I've been trying to find a 3 year anniversary present. Leather. Seriously? But I found it. A basket with leather handles that we can reuse (once emptied of its deliciousness) as a bread basket. After the goodies are gone, he can still use the cooler! I voted for you on Macy's! My husband would love the Starbucks® Break Time Gift Basket. I like the Father's Day Fresh From The Orchard Fruit Basket. http://ww31.1800baskets.com/product.do?baseCode=93647&dataset=11176&cm_cid=d11176 Is the link to the beautiful Orchards Fruits Basket that I love! I'm diabetic & my dad died this year so I'd keep this for myself & think about hin while I'm munching away! What a great giveaway I am so jealous! Barb G. I also signed onto your google friends connect box. Email: direcotrylanesuperstoreATgmail.com Think that's everything for the main entry! 1) I follow Ascending Butterfly publicly. Voted for Yay4WkEnd @ Macys. he would love the classic plaid sweets tower! 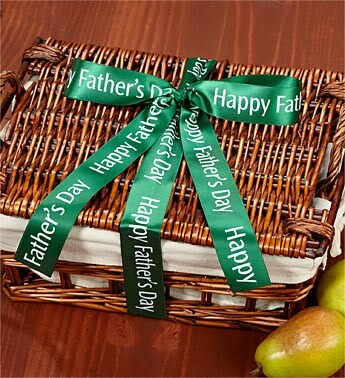 gourmet Happy Father’s Day wish with mouthwatering Lucca & Sons Market™ meats like USDA-approved Gourmet Smoked Beef Summer Sausage and Beef Salami, cheeses and snacks in this solid pine wood frame crate with a convenient sliding lid. This is the item I posted about! i commented on your post: Today's Words of Inspiration - Change Your Reflection! I voted (Bloggers Choice ’10 Awards in the ‘Best Blog About Stuff’ Category). It said you had 42 votes after I logged in and checked it.